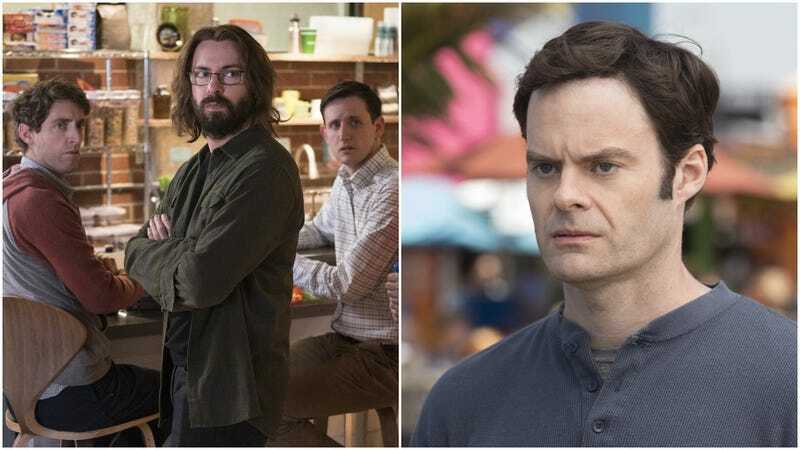 We can now add “a timely return for Silicon Valley” to semi-reluctant hitman Barry Berkman’s list of victims; per TVLine, the critically beloved HBO actor-murder comedy has just inadvertently caused an apparent year-long delay for the network’s long-running techbro comedy series. It all comes down to the time and attention of producer Alec Berg, who acts as showrunner for both series. Unable to be in two places at once—get on it, disruptors—Berg has apparently set up his schedule to favor Barry, meaning that Silicon Valley isn’t going into production until the summer of 2019. In practical terms, that means the show—which stars Thomas Middleditch, Kumail Nanjiani, Martin Starr, Zach Woods, Amanda Crew, and the blank spot where T.J. Miller used to stand—won’t be back on the air until 2020. It’s not entirely clear whether Berg will be spending the intervening time cranking out the second season of Barry, which ended on a big, messy cliffhanger back in May, or if he’ll just be recovering from all this showrunning he’s been doing, all the time, with all these shows he runs. It’s also not clear if this upcoming season of Silicon Valley—whenever it arrives—will be the show’s final outing. Berg and Middleditch have both suggested over the last few years that the show was getting close to running its course, as the constant up-and-down of “Will they make it? Oh, they’ve been destroyed! Oh, now they’re okay again” plays out over and over again.